I couldn’t let this year pass without sharing a fun St. Patrick’s Day dessert, and what is more fun than a dessert that combines two different types of booze! Oh yes. Things just got real. 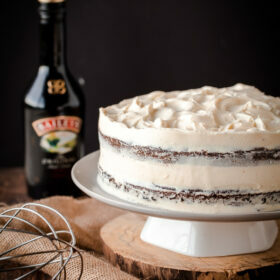 The darkest of Guinness Stout cakes topped with the most luscious Bailey’s cream cheese frosting. Don’t you just want to dive in and take a nap on the stuff? Even though St. Patrick’s isn’t a huge holiday in my household (despite the fact that I’m marrying an Irish ginger, does this give me more credibility? ), I certainly enjoy the foods that come along with it. Particularly, the desserts. 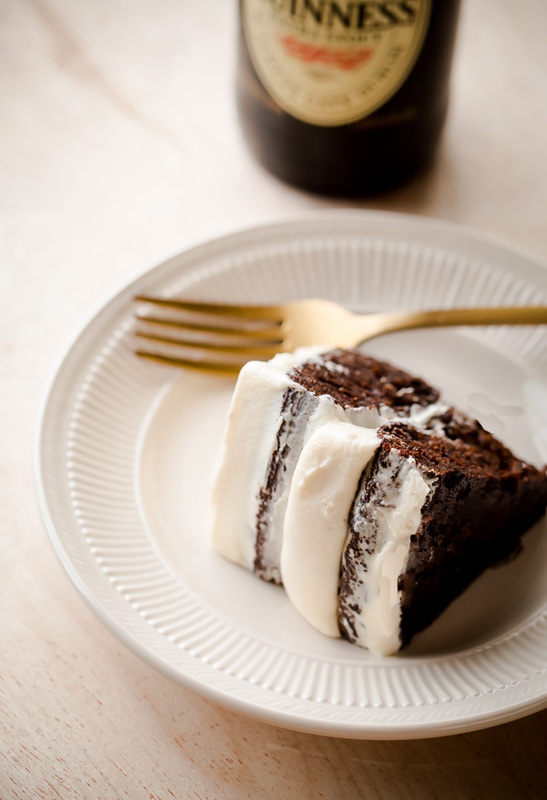 This Guinness stout cake happens to be one of my favorite cakes! It is incredibly dark, and full of tons of spices and flavor without being overly sweet. The color of the cake is purely from the addition of an entire cup of unsulfured dark molasses and Guinness stout beer. The spice flavor comes from ground cinnamon, ground nutmeg, ground cloves, ground ginger, and freshly grated ginger root! I learned how to make this cake while I was working on the pastry station at my post-culinary school restaurant job. It is actually a very simple cake to throw together, and bakes up very quickly. 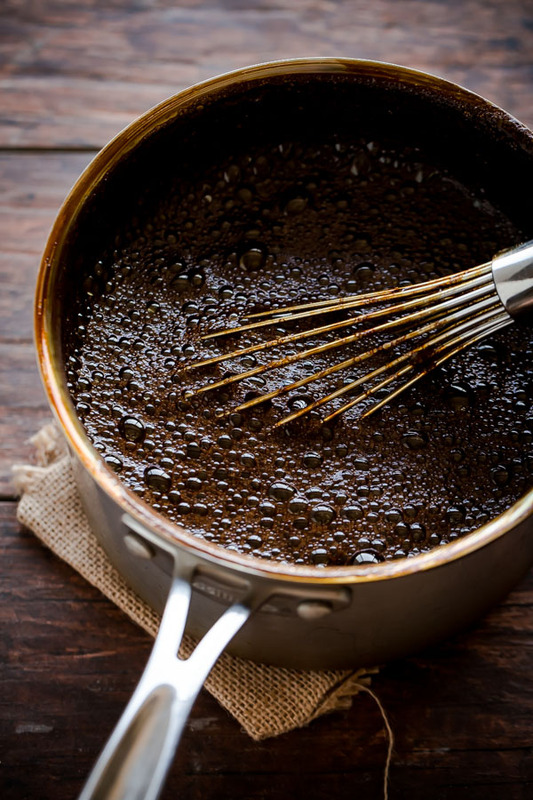 The one slightly more complicated–and complicated is a major exaggeration–recipe step involves combining the unsulfured molasses and Guinness stout in a large saucepan on the stove, bringing the mixture to a boil, removing it from the heat, and whisking in the baking soda. As you can imagine, the mixture bubbles up quite a bit at this stage, so I highly, highly recommend using a large saucepan to do this, preferably one that is four quarts in size or larger. The last thing I want is for you to use a small saucepan, and slowly watch in horror as it overflows onto your stove top, while cursing my name at the same time! Not so fun. Let’s keep the clean-up as minimal as possible. Once the cake has baked and cooled, it’s time to whip up the cream cheese frosting! It comes together in less than 10 minutes and is good enough to eat with a spoon. I had to stop myself from doing this several times. I’m a sucker for cream cheese frosting. Even though I decided to go with the now popular ‘naked cake’ look on the sides of the cake, feel free to decorate the cake as simply as you want. You could easily spread a thick layer in the center, and then just spread the rest very simply on the top layer, leaving the sides untouched. Since the cake layers are relatively thin (for this reason and the sake of not wasting cake, I don’t recommend leveling the cake layers), it is definitely meant to be a more rustic two-layer cake. Although the cake is flavorful and moist enough to be served on it’s own, I loved pairing it with the sweeter cream cheese frosting spiked with Bailey’s Irish cream. 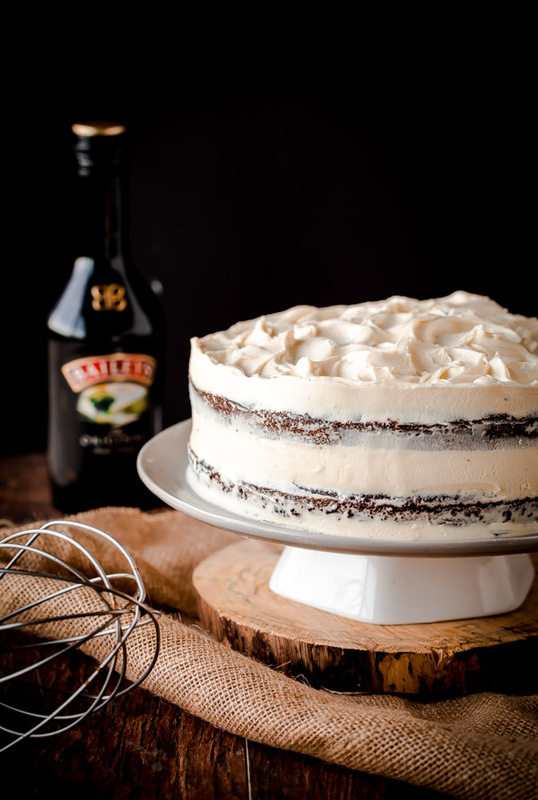 Despite it being a strongly spiced and flavored cake, the Bailey’s still shines through! Does a cake get more festive than this? Nope. Oh and feel free to pair a big slice with the remainder of your Guinness beer! Preheat the oven to 350 degrees Fahrenheit. Grease two 9-inch cake pans with baking spray, and line the bottoms with parchment paper rounds. Grease the parchment. Set aside. Prepare Cake: In a large saucepan (4 quarts or larger! 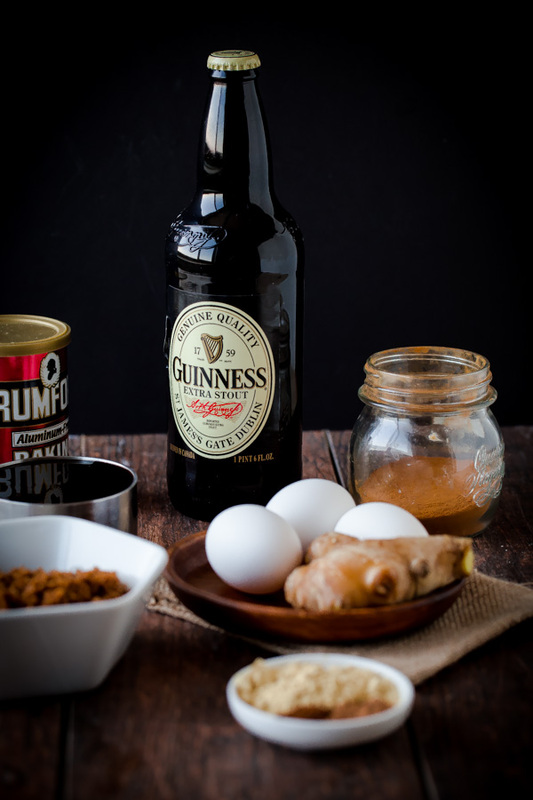 ), whisk together the Guinness stout and molasses. Bring to a boil over medium-high heat. Immediately turn off and remove from heat, whisk in the baking soda–be careful as the mixture will foam and bubble significantly. Allow the mixture to sit, whisking occasionally, until the foam dissipates (this could take 10 to 15 minutes). In a medium bowl, whisk together the eggs, granulated sugar, and brown sugar. Whisk in oil. In a separate large mixing bowl, whisk together the flour, baking powder, and ground spices. Set aside. Once the foam has dissipated from the Guinness/molasses mixture, whisk it slowly into the egg and sugar mixture. Whisk the liquid mixture into the flour mixture gently, half at a time, until just combined. Stir in the fresh ginger. Do not over mix. Transfer and divide the batter evenly among the prepared cake pans (tip: the total batter weight=1250 grams; each cake pan should get roughly 625 grams of batter). Bake the cake, at center rack, at 350 degrees (F) for 28-35 minutes, or until the top springs back lightly when touched. **Do not open the oven door, as the cake has a tendency to fall in center. Allow cake to cool in pans on a rack for 15 minutes, before carefully removing and placing on a cooling rack to cool completely. 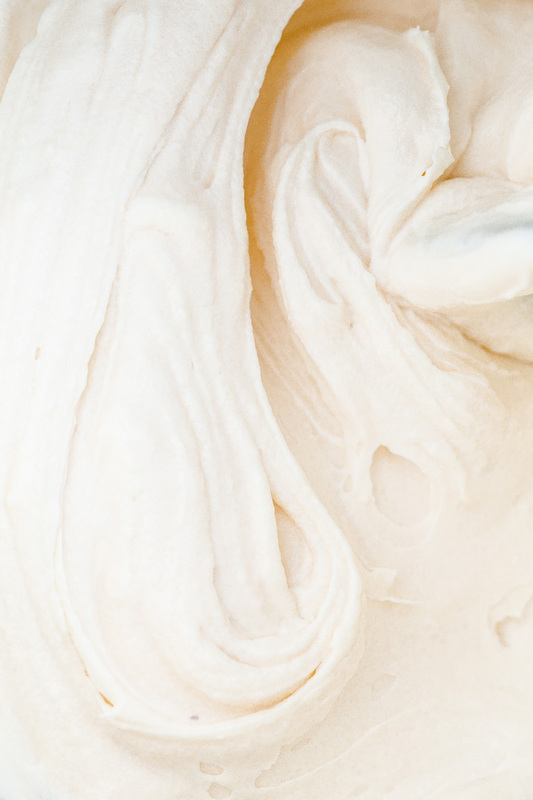 Prepare Cream Cheese Frosting: Once cake has cooled completely, prepare the frosting. Place the butter, cream cheese, and salt in the bowl of a stand mixer, fitted with a paddle attachment. Beat together at medium speed for 3 to 4 minutes, or until creamy. Reduce speed to low, and slowly add the powdered sugar a little bit at a time. Reduce speed to slow and add the Bailey’s Irish cream and vanilla extract until incorporated. Scrape down the sides and bottoms of the bowl, increase speed to medium and beat frosting for 1 to 2 minutes until light and fluffy. Assemble Cake: To assemble, place four strips of wax paper on edges of a cake stand or serving plate. Since this cake produces relatively thin layers (and is meant to be more rustic), I don’t recommend leveling the cake layers, as you will waste a lot of great tasting cake! Place one cake layer on the bottom of the plate (top side up). Scoop roughly 1 cup (or more) of cream cheese frosting over the first layer, and use a large offset spatula to evenly spread the frosting until it just begins to go over the edges of the cake layer. Top with the remaining cake layer (bottom side up). Using an offset spatula, cover the top and sides with a thin layer of frosting Refrigerate for 10 to 15 minutes. Using a large offset spatula, cover cake again with remaining frosting as desired–I did a very thin layer on the sides to achieve a ‘naked cake’ look, and kept it relatively thick on top, using my offset spatula to create waves and ripples! Cake best served the day it is baked. Serve at room temperature or just barely chilled. Store leftover cake covered in the refrigerator.